The club Annual Festive Evening organised by the International & Foundation Committee will take place on Tuesday 20 November. Date and time: Tuesday 20 November, 7.00 for 7.30 pm. Venue: Castle Grove Masonic Hall, Headingley; parking available. The dinner: three courses plus tea/coffee. The entertainment: Cirquels - associate member Mark Songhurst and friends - display their circus skills for our delectation and delight. The cost: £25 per head - the same as last year. A raffle will be held during the evening. We are raising funds for the Lighthouse School, Cookridge. The school is for young people aged 11 to 19 with an autistic spectrum condition or related communication disorder. We are aiming to help the school’s PTA to improve upon the present utilitarian furnishing of a common room to make it a more welcoming space. Greater usage by the students will go towards improving their communication and social skills, and enhance such life skills as taking responsibility for keeping the area clean and tidy. 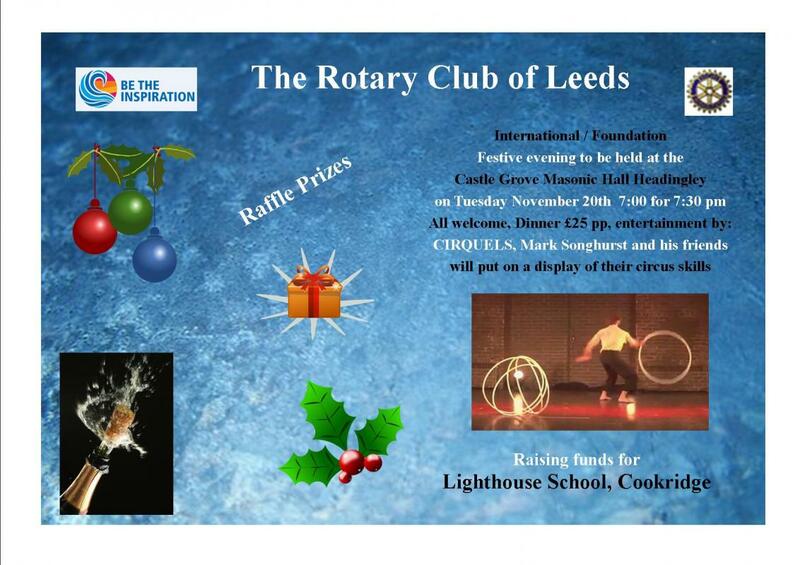 If you can't join us for the evening, I hope you will consider a donation: cash, or cheque payable to Rotary Club of Leeds CTF, please.